Major Ian Brown discusses the evolution of the Marine Corps’ doctrinal publication, MCDP-1: Warfighting. After the Vietnam War, Marine Corps thinkers re-evaluated how to think about fighting wars. The term “attrition” meant defining success in body counts, and was the prevailing focus of the Vietnam War. “Throwing more men and material at a problem” is another way to describe attrition. Since this style of warfare failed in Vietnam, the Marine Corps sought a new concept of war. Maj Brown writes extensively about this history in his forthcoming book, A New Conception of War: John Boyd, The U.S. Marines, and Maneuver Warfare. Sometimes referred to as the “maneuver warfare movement”, this term represents the emergence of a new mindset. Maneuver warfare was a way of thinking about how to win any conflict from guerrilla-style insurgencies to conventional conflicts against major powers like the Soviet Union. Terms like tempo, surprise, deception, and shock to the enemies’ system described warfare by “maneuver”. As a theory, maneuver warfare focuses on getting inside the enemies mind and shattering his cohesion. While the American military has always had a “physical, material” focus, Vietnam instructed military thinkers that material advantages were only a partial component of victory. There had to be a change in mindset. The answer could not always be to throw more men and bombs at a problem on the battlefield. There had to be a change in the way the military and the Marine Corps thought about defeating the enemy. The new, sophisticated approach looked at developing systems in which a unit could adapt faster than the enemy and respond quicker to changes on the battlefield. The ability to transition and apply pressure on the enemy at a decisive place and time speaks to this new conception of maneuver warfare. Colonel Boyd was a pilot in the United States Air Force. His work focused on transitioning states of energy in aircraft that Boyd described as the Energy-Maneuverability (E-M) theory. Maj Brown explains that Col Boyd’s ideas on E-M continue to be relevant today. Furthermore, Col Boyd also helped with the development of the F-16. When Col Boyd retired from the Air Force, he explored ideas on warfare that would be critical to the Marine Corps. In his essay, “Destruction and Creation”, Col Boyd looks at mismatches that create one’s ability to survive and adapt. As a result of this essay, Boyd embarked on a deep study into military history. From his studies, he developed a brief called, “Patterns of Conflict.” Boyd gave his brief to Marine leaders, and quickly found that he had a captive audience. 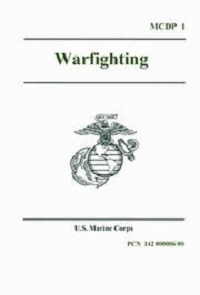 When reading Warfighting, context is important. FMFM-1, the first draft, was published in 1989, and it emerged from post-Vietnam analysis. Meanwhile, when it was updated to MCDP-1: Warfighting in 1997, the Cold War had ended. Thus, the history of both points in time- post-Cold War and post-Vietnam- should be considered when reading Warfighting.